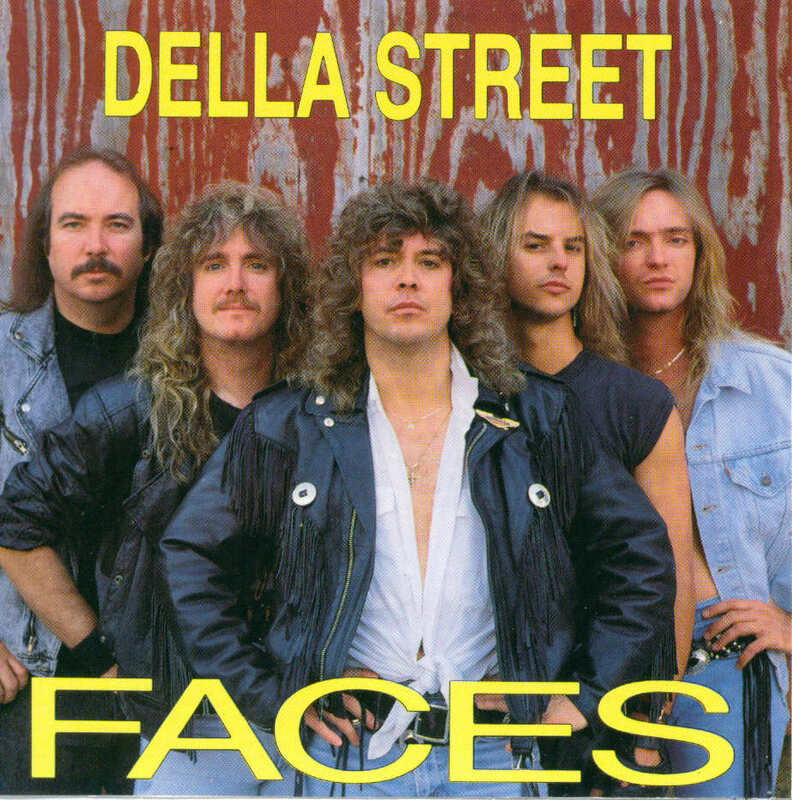 Della Street page - 1986-'94. 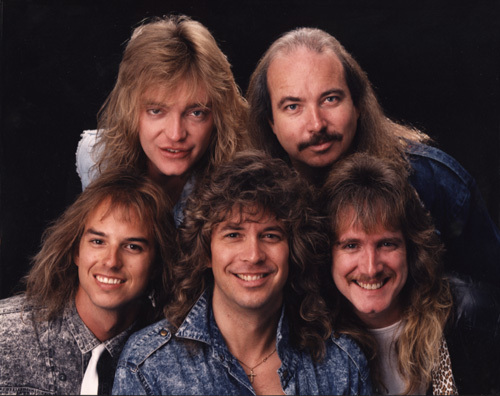 From left to right and top to bottom: Mark Scheele (Lead Guitar/Vocals), Ron Logan (Keyboards/Guitar/Harmonica/Lead Vocals), me (Drums/Percussion/Vocals), Marshall Nelson (Lead Vocals/Guitar), Jeff "JJ" Johnson (Bass/Vocals). Below is a scan of our CD we realeased in '89, I believe. I have a few copies left I'll let go for 35 bucks each if anyone is interested. I would give them away, but I don't have that many, and I figure if you're willing to spend 35 bucks on the CD then you're really interested in Della Street's music and not just looking for a free CD case. The 35 bucks will cover shipping and handling. I don't do this for a living and am a full-time sto0dint so give me a few days to ship. Click either image for a larger resolution picture. So I get a call from a buddy of mine, "Donnie, go to this eBay site...your CD's are selling for 40 bucks!" Not believing him I went to eBay to check it out. 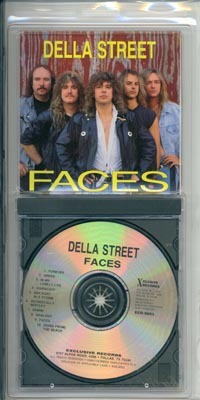 Sure enough, Della Street CD's are commanding a pretty handsome price these days. Note that the sellers are located in Las Vegas, Nevada and Dallas, Texas (where our management company was). I have never met either seller. I have no idea who they are or where they got our CD from. Even freakier is that two of the copies are signed by the band. The CD that shows the signatures (Auction #2) is authentic. Click on the eBay icons below to view the auctions. Della Street CD Auction #1. Della Street CD Auction #2. Della Street CD Auction #3. I have to say with all honesty that if it wasn't for my girlfriend at that time, Jamey Harp, I never would've hooked up with Della Street. Jamey was working as a waitress at a bar in Albuquerque called The Launch Site. Sometimes she would work the day shift, but more often times she worked the night shift. That was how I met her - waitressing at night. Marshall Nelson and Ron Logan were doing a happy hour gig there during the day, so Jamey got to know them fairly well. One day she says to me, "There are these guys, Marshall and Ron, that sing during happy hour. They said they were getting a band together. Maybe they need a drummer..." This was excellent because I had just been fired from the Steve O'Neill band and I needed a gig. The next day I went down to The Launch Site to meet Ron and Marshall. Ron was off somewhere so I thought I would introduce myself to Marshall. After talking for a few minutes I told Marshall that I was a drummer - a good drummer - and was in need of a gig. He told me that they already had a drummer, Mark Simma, and though he appreciated me talking to him, they really had no need for a drummer. The band was formed and already rehearsing. I tried to give Marshall my number but he wouldn't take it. I finally forced the number on him by saying, "Look...just take my number and hang on to it for a while just in case things don't work out with Mark." The next day Marshall called me..."Hey listen...Mark just quit the band. Are you still interested in doing the gig?" Are you kidding? I was totally stoked! "Yeah, I'm still interested..."
Though the Della Street guys had heard of me, I really didn't have much of a reputation around Albuquerque. Though I had been playing for years, 90% had been done either out on the road, or in the "underground" funk clubs. I was going to have to audition. Though Mark was a fine drummer, I was sure I could play at least as well as he could. The next day I brought my kit to Mark Scheele's house, where we eventally started practicing. I had a very large drum kit, and I'm almost sure that this was one of the reasons I got the gig. Back then, more than now, bigger was better. Since I easily had the largest kit in the city, this was a distinct advantage. In addition I could sing harmonies. If I recall, Mark Simma didn't sing. After a few songs it was quite apparent that we all played well together. Afterwards, the Della Street guys told me that they would let me know the next day if I had passed the audition. I think they let me leave my kit there if I recall, which was an indication to me that I was at least in the running. Honestly I was pretty excited to join. The next day I got a call from Marshall, "Look...you're in if you want the gig, but we gotta tell you a couple things before you join. We wanna have a meeting." At the meeting they told me a couple things - things that had caused Mark Simma to quit. The first was that they were going to try to book around the local booking agent, Joe Buffalino and Associates. Joe had cornerned the band/club market in the Albuquerque area. No bands could play anywhere in town without signing a 1 year contract with Joe and giving up a slice of the pie...a large, 15% slice of the pie, to be exact. I certainly didn't want to give up a piece of my paycheck, so I was all for the Della Street plan. I'm cheap by nature and hate paying anyone for anything (hence; building my own website). Besides, it didn't make sense to me to pay someone to book us in our own back yard. I had used agents out on the road, but they had booked us in venues hundreds of miles from home. Using an agent to book a gig in a venue right down the street just didn't make any sense to me. Besides, because I had worked out of town so much, I'd only done 1 gig through Joe up to that point anyway. So not booking gigs through Joe was something I'd been doing for years anyway. The Della Street guys warned that it would not be easy, but Marshall had a hell of a reputation in town because of a band he'd been playing in called, "Old Scratch," and Ron had the same reputation through "Sassy Jones" and El Paso-based, "Windfall." Jeff and Mark also had reputations because of various local bands they had played in. Though booking around Joe was a pretty ballsy maneuver in Albuquerque at that time, we decided that we were going to go for it. The other "bad thing" the Della guys had to tell me about was they were going to play classic Rock-n-roll exclusively, period. Though the term "Classic Rock-n-roll" is a household term these days, back then it wasn't. Bands were playing new stuff not only because the new stuff was good back then, but because Joe Buffalino was dictating to them what to play. Playing classic Rock-n-roll exclusively hadn't been done by any other band in the city and wasn't really being done by any other band in the country, as far as I know. This was the other thing that scared Mark Simma off. Again, I was enthralled with the idea. We eventually had shirts made up that read, "No Top 40." As was pointed out to me by fellow drummer and good friend Bob Gordon, "You guys are playing top 40 - top 40 of yesteryear." I guess Bob had a point. We rehearsed for 3 months prior to playing a single note on any stage. I find that funny now because these days it's rare a band rehearses more than 5 times before doing a gig. I don't know if it's because we're all faster learners or the market dictates cost ineffectiveness if a band has to rehearse too much. We were lucky because Marshall's girlfriend's father had a real-estate business with a ton of rental properties. He needed man-power to paint rooms and fix swamp-coolers, so the Della Street guys were called to work. Ron and I fixed coolers while the rest of the guys painted. It was a good situation. Eventually it came time to hunt for Sound and Lighting engineers. Again, back in those days you couldn't do a gig without some kind of sound and lighting production. Della Street wanted to come out with BANG! - and "bang" we did. Not only did we end up with the largest lighting and sound production in the city, but because of our 3 months of rehearsal we had over 100 songs ready to go - unheard of these days. We could play 3 nights in a row and not repeat a single song. 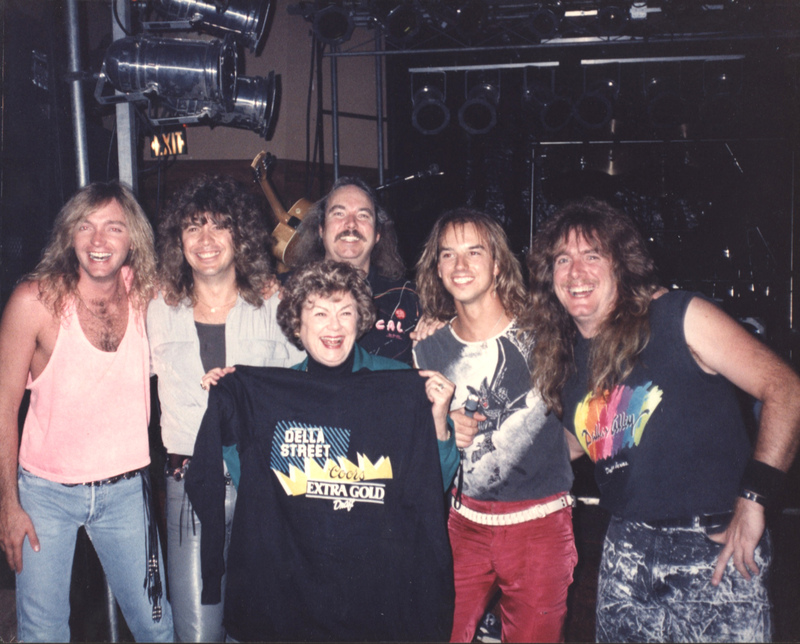 In addition we had a dozen medleys consisting of "hall-of-fame" bands like Zepplin, The Beatles, Boston, Styx, REO Speedwagon, Van Halen and on and on. In addition we had music from progressive bands like Yes and Kansas. Musically we were as well prepared as any band could possibly be. I got to watch us perform on video once. We really were quite entertaining to watch. Our original production staff consisted of Stan Welch and Todd Willis - Stan doing sound and Todd doing lights. Stan could only be with us temporarily, so he was eventually replaced by John Barklay, who was one of the top sound engineers in Albuquerque at that time. Many years later Todd Willis would be replaced by Todd Kurkowski. Stan (our original engineer) had a HUGE P.A. system consisting of a dozen or so A7 cabinets (the speakers to have in those days) powered with like 10,000 watts of power. Todd Willis had over 60 par cans and like 60' of trussing. In addition he had fog machines and other toys. With these guys on our side we couldn't lose. We all agreed to take equal cuts of the pay. 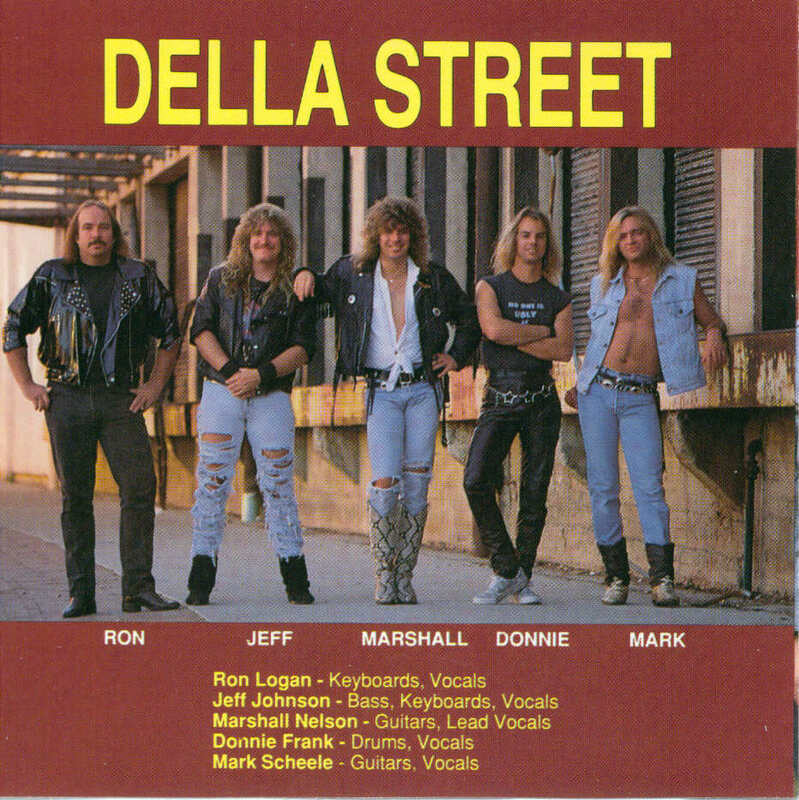 Della Street refused to pay any engineer more than the band members were making. Most local bands of that era were paying their engineers almost double that of any band member. Stan and Todd were happy to join the team as equal players. The stage was set. Honestly a lot of club owners were intimidated by Joe, and for good reason. Joe had the bands they needed. In addition he also represented the clubs the bands needed. Joe was also a liaison between the band leaders and the club owners. Admittedly, Joe kept things running pretty smoothly. Bands were always working and clubs were always full. Another note-worthy item was that bands were playing 5-7 nights a week back then. Consequently Della's first club date started on a Monday night. Our chosen venue was The Bird on Gibson Blvd. Al and Rick Gabaldon were immediate supporters of Della Street. 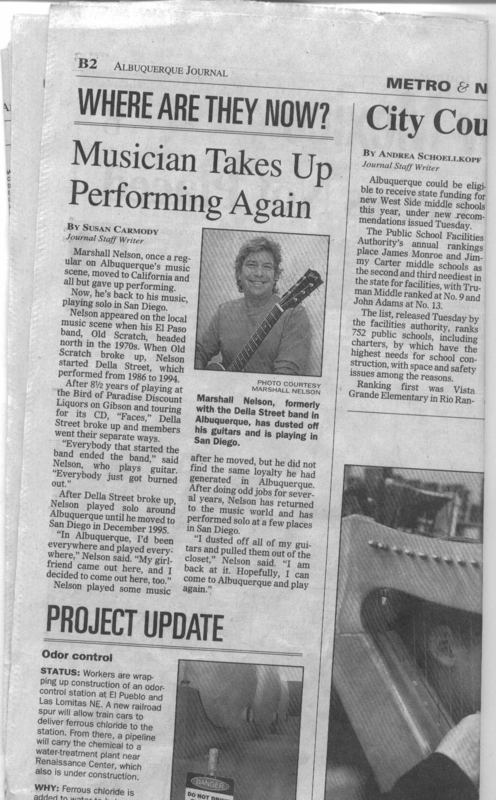 Consequently we opened at the Bird and eventually played there exclusively when in Albuquerque after we had secured enough out-of-town accounts to keep us booked solid. Ron Logan had the thankless job of "booking agent" and "accountant." I never drank, so it was easy paying me at the end of the week. The other guys always got drinks on account so this made Ron's job of paying everyone a real nightmare. The countless hours spent trying to figure out who drank what had Ron in a perpetual state of frustration. Though I didn't much think about it then, I sure am glad I wasn't stuck with that thankless job. Our first gig was a "beach party" held at the Albuquerque fair grounds July of '86 (thank you, Mr. Johnson, for that information). I remember getting my ear pierced the day before the gig in celebration of Della Street's first gig together. As I recall, a couple bands played that day. I think we did a 1 hour set. We definitely made our mark that day and set a new standard for cover bands. Opening night was on a Monday at an Albuquerque club called, "The Bird," which was short for "The Bird of Paradise Discount Liquors." I don't remember the exact date but it was in August of 1986. The club was, indeed, packed. You couldn't get another soul in there. The club stayed that way the entire opening week and the week after and the week after that. We played 6 nights a week. Monday looked like Friday which looked like Wednesday. It didn't matter. Every night we performed the club was packed wall-to-wall with people. Honestly, it was glorious. This pattern of packing clubs continued for Della Street for years and years. Della Street was sponsored by Coors for a while. During that time we played in Golden, Colorado quite often (home to Coors beer). During one of those engagements one of the Coors representatives told us that Barbara Hale (the actress who played Della Street on the T.V. series, Perry Mason) was in town, and wanted to meet us! Sure enough, one evening during one of our sets she showed up and took this picture with us. To date, this is one of my favorite pictures of all time. She was one of the nicest ladies you'd ever want to meet. Della Street eventually split up. Ron Logan moved to Dallas, Texas to persue better opportunities in the music industry. To this day he's still making a great living playing music in the Dallas and Oklahoma City areas. Of all the players in Della Street I always thought Ron deserved success more than the rest of us. Infinitely patient, abundantly talented, and a tenacious worker made him a winning bet for success. Jeff Johnson plays in a band called Quizling. I have seen them many times, and to date, they are my favorite Albuquerque-based band. Mark Scheele is working for the D.A. 's office here in Albuquerque. I don't know if he's continued his guitar endeavors or not. Last I heard he was not playing at all, however that is an unsubstanciated rumor. What ever happened to Marshall Nelson?! "Hello. Is this Donnie Frank?," said the female voice at the other end. All I could think was, "Oh great...another paternity suit!" I answered, "Yes, it is." The voice then asked, "Is this the Donnie Frank that played in Della Street? Oh great...an audit. I was hesitant, but I said yes. "I'm Susan Carmody from the Albuquerque Journal. I'm doing a story for the 'Where are they now' section of the Journal. I'm looking for Marshall Nelson." Wow...I hadn't spoke to Marshall in years. And honestly, I wasn't sure of how to get a hold of him. Totally coincidentally, a mutual friend of ours, Lou Lehman, had sent a Christmas card with her contact information. I knew that Lou had stayed in contact with Marshall because she had mentioned him in her card. I told Susan that I didn't have Marshall's number at the time, but that I might be able to get it for her. After hanging up with Susan I called Lou. Lou was home. I wished her a Merry Christmas and proceded to ask her if she had Marshall's number. She did. This page is up as of February 24, 2005 - 12:AM, and was updated February 9th, 2006.